IWAKI, Fukushima Pref. (Kyodo) Nissan Motor Co. President Carlos Ghosn said Tuesday the automaker plans to resume partial production in mid-April at an engine factory in Iwaki, Fukushima Prefecture, damaged by the March 11 earthquake. Ghosn, who visited the Iwaki plant, told reporters Nissan plans to resume full-fledged production at the factory in early June at the latest. Although Nissan is facing difficulties in repairing facilities and equipment at the plant — it’s located about 50 km from the crisis-hit Fukushima No. 1 nuclear plant — Ghosn pledged that the automaker will never pull out of operations in Iwaki. After examining efforts by plant workers to return operations to normal, Ghosn encouraged some 300 employees and others who gathered for his visit to demonstrate “fighting spirit” in reviving the factory. The plant manufactures engines for the Fuga luxury sedan and other models. The Fuga is known as the Infiniti M sedan in various overseas markets. Nissan said it has almost completed repairing a building at the plant but is still working on production equipment. In addition, water has not yet been restored. The quake damaged parts of the plant’s floor and exhaust vents, while causing some equipment to malfunction. 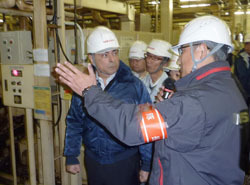 Ghosn also visited a showroom of the automaker’s affiliated sales company, Fukushima Nissan Motor. In a meeting with Iwaki Mayor Takao Watanabe, Ghosn pledged that Nissan will contribute to the regional economy by reviving the plant’s operations, company officials said.